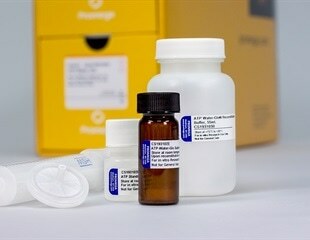 Promega Corporation's new Promega Water-Glo™ System, launched this week, offers a highly sensitive and flexible measurement tool for monitoring microbial contamination in freshwater, process water, seawater or wastewater samples using bioluminescent technology to measure adenosine triphosphate. Canadian researchers, working in partnership with Brazilian colleagues, have developed 13 bioluminescence sensors for use in testing the effectiveness of new medical drugs in the laboratory. A team of Medical University of South Carolina Hollings Cancer Center researchers received a three-year, $1.2 million grant from the U.S. Department of Defens to test a potential therapeutic antibody that could block breast cancer growth with fewer side effects, opening up potential for future drug development. Researchers from Eindhoven University of Technology (The Netherlands) and Keio University (Japan) present a practicable and reliable way to test for infectious diseases. Researchers of the University of Würzburg have developed a method that makes it possible to measure the activation of receptors in a very short time. This might speed up the development of new drugs. Researchers at Tokyo Institute of Technology propose an improved mouse model that could revolutionize bone metastasis research. Their method, which involves injecting cancer cells via the so-called caudal artery in the mouse tail, overcomes many limitations of traditional mouse models. The Institute of Biomedical and Pharmaceutical Sciences at Guangdong University of Technology in Guangzhou – China, has successfully installed a VECTor5 Hybrid OI/CT system from MILabs. It is a gruesome spectacle that meets the eyes of Prasad Aiyar as he looks down the microscope. The doctoral candidate from India, who came to Jena to do his Master's degree in Molecular Life Sciences, examines the species Chlamydomonas reinhardtii on a microscope slide. University of Alabama at Birmingham biomedical engineers report a significant advance in efforts to repair a damaged heart after a heart attack, using grafted heart-muscle cells to create a repair patch. For a cancer drug to be successful, it needs to reach the malignant tumor site. Researchers in Japan have now found a way for increasing the effectiveness of drug delivery to certain types of brain tumors, by packing epirubicin, a known antitumor agent, in specially designed polymeric micelles. A University of Colorado Cancer Center study takes a new approach to killing cancer: Why not fry it into oblivion with vibrating gold nanoparticles? "But what about the frickin' lasers?" you may ask. Don't worry. There are lasers. And bioluminescence too. Rice University engineers are building a flat microscope, called FlatScope TM, and developing software that can decode and trigger neurons on the surface of the brain. Enzyme Indicators (EI’s) have been proven as a revolutionary viable alternative to biological indicators (BI’s) for Hydrogen Peroxide decontamination validation. A new study published in the journal Molecular Therapy reveals that HIV DNA in the genome of living animals can be removed to eliminate further infection. While a permanent cure for infection caused by HIV remains a challenge due to the ability of the virus to hide away in latent reservoirs. The study team comprising Wenhui Hu, Kamel Khalili, Laura H. Carnell, and Won-Bin Young carried out an experiment on three different animal models. A permanent cure for HIV infection remains elusive due to the virus's ability to hide away in latent reservoirs. But now, in new research published in print May 3 in the journal Molecular Therapy, scientists at the Lewis Katz School of Medicine at Temple University and the University of Pittsburgh show that they can excise HIV DNA from the genomes of living animals to eliminate further infection. That's the hope of Associate Professor Noriyuki Yanaka and researchers at Hiroshima University who have developed a non-invasive way to assess the anti-inflammatory properties of fortified health foods and medications. A new kind of bioluminescent sensor causes individual brain cells to imitate fireflies and glow in the dark. Tumor detection using targeted fluorescent imaging probes is a promising technology that takes advantage of specific molecular events occurring in cancer tissues.